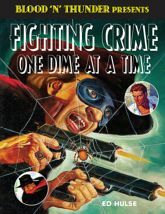 The Shadow, The Spider, The Avenger, Doc Savage, The Black Bat, The Phantom Detective - these swashbuckling heroes of mid-20th-century pulp fiction all had one thing in common: They fought crime from outside the law, unhindered by red tape and unmindful of such legal niceties as due process. They fought with fists and guns, for the most part hiding their true identities beneath outlandish costumes and grotesque disguises. This collection of essays by distinguished pulp-fiction aficionados chronicles the era of single-character magazines from offbeat angles and with keen insight. The pieces herein analyze key stories and characters while offering rare, behind-the-scenes glimpses of authors and editors at work, crafting and polishing the pulp-paper fever dreams that enthralled millions of young readers during the Great Depression, World War II, and beyond. Ed Hulse, editor of Blood 'n' Thunder, the award-winning journal of adventure, mystery and melodrama, has assembled these affectionate essays with loving care and a discerning eye for the high-water marks in this phase of American popular culture. This third volume of Blood 'n' Thunder Presents, like its predecessors, is profusely illustrated with pulp-magazine covers and original artwork.